NEW DELHI: Delhi Chief Minister Arvind Kejriwal's convoy was attacked on Friday afternoon by a mob armed with sticks. But there are no reports of injuries or casualties yet, said an official from the Chief Minister's Office. The incident reportedly took place in North Delhi's Narela where he had gone to inaugurate development works in 25 unauthorised colonies. A group of about 100 men tried to stop Kejriwal's car and attacked it with sticks. The attackers also reportedly attempted to break the window of CM's car. 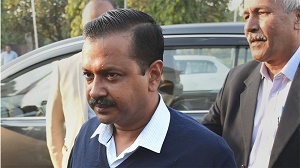 In November 2018, a man threw chilli powder on the 50-year-old Chief Minister outside his office in the Delhi Secretariat. Delhi Police later found the attacker was "unstable and incoherent". The CM's office had in January 2019 received a call from a person informing about the threat of a possible attack on the CM. Though the person did not identify himself, he said that he was calling from west Delhi's Vikaspuri. The call came close on heels of an email that was sent to Kejriwal's office threatening to kidnap the CM's daughter. The accused was later arrested by a team of the Special Cell from Bihar's Motihari after his IP address was tracked.